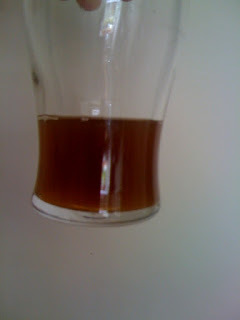 I wrote here about my latest homebrew beer. In a nutshell, it's a US style IPA, using a single hop variety but with an ABV of 2.5 per cent. The idea being that it's something you can easily drink a couple of pints of, without having to compromise on flavour. It's essential that the beer doesn't become hop tea, so a high percentage of specialty malt was used in the grist, whilst aggressive dry hopping will provide a massive hop aroma up front. The hop was a toss up between Amarillo and Centennial, with the former just winning out in the end. Both hops are awesome, hopefully Amarillo will lend a grassy, citrus flavour and a grapefruit, pithy bitterness. The photo above is a little dark, but I think the colouring was pretty much nailed. There's already amber, dull-copper tinges around the edges and when this drops bright, with any luck, it'll be a glowing, vibrant, flame colour. I stayed true to the plan in my original post, the only slight modification being an (accidental) increase to the gravity. I planned on 15 litres at 1027 but ended up with 14 litres at 1030. Given an approximate attenuation of 70 per cent, and therefore a final gravity of 1009, I should end up with a beer around 2.8 per cent. A little higher than planned, but I wouldn't be surprised at all if primary fermentation finishes above 1009. I mashed high on purpose and 1009 is a pretty low final gravity to hit. The [terrible] photo above shows the measured mash PH. This is the first time I've treated water when making beer. If you ask me, a lot of people talk a lot of hot air about water treatment. I've made perfectly decent beer using some of the hardest water you'll find, without even the merest attempt to treat it. None the less, the chance to improve the beer you make isn't something to be sniffed at, with that in mind I'm attempting to find the best treatment for the water I use. 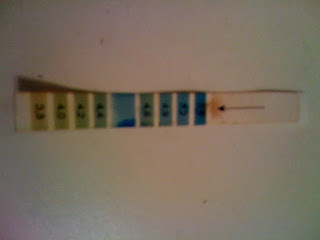 I dipped a toe in the water with a middle-of-the-road treatment and the end result was a PH still above 5.5 ... I'll increase the dose next time! So this is now fermenting away quite nicely. I'm expecting primary to be faster than usual, but I'll still give a week to ten days before racking to secondary and beginning the dry hopping. My guess is that this will be one to drink young, so it should be chilling in the fridge before long.